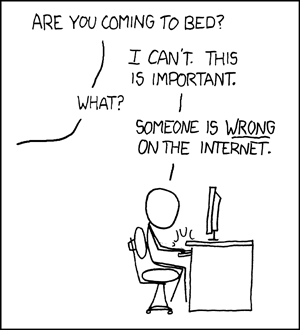 All too often when traversing the world wide web, you run into someone who is wrong. Not just a little wrong, but like blatantly wrong. Egregiously wrong. So wrong that you feel compelled to correct them. Facebook is great for this because it’s a place to collect all the people who you’ve ever known—parents, grandparents, high school classmates, college buddies, and the occasional coworker—and all of those wide and varied people have wide and varied opinions. Some of which are wrong. Some of which are racist, homophobic, misogynistic, or any of the other flavors of awful. Because we know (or knew) these people, we feel the need to help them. To make them peer outside of their little box. See, all of us are born inside boxes. They start out very small and grow as we get older. Each new experience that we absorb and take into ourselves grows the box a little more, makes it a little wider, as we make space for these new ideas. First, your box is just your immediate family, then your classmates. Sometimes the box stops there, at high school, if you’re the kind of person that just stays in your hometown and doesn’t bother spreading any further than that. And that’s okay. Some people don’t need big boxes. Some people are happy with the box they have. Then there are those who go off to college and absorb all kinds of new ideas, meet new people. There are the people who travel, who leave behind their hometown, even their home country, and experience the wider world. You don’t even have to leave your house to do that anymore. Get on the internet. Meet new people. Learn things. Grow your box. The person I was arguing with had a tiny box, and it took me a while to remember that. I like to think my box is pretty large—I’ve befriended people from all walks of life, of all races and religions. It’s not the biggest box but it’s much larger than the box I had when I left the very small town I grew up in. This person hadn’t left that small town. Their box hadn’t grown like mine had. Some people are looking to expand their boxes. You can inform them. You can educate them. You can point them to multiple news articles and go “See, here’s this thing that shows you were wrong” and they’ll be like “Oh! I didn’t know!” and their box will grow. I was stuck talking to a rock. They did not want their box to grow. In fact, their box wasn’t much of a box anymore. It wasn’t flexible. Its walls were concrete, not cardboard. No amount of evidence would prove them wrong. They were steadfast in the wrongness. They had entrenched themselves inside their hardened walls and burrowed down into the earth. They were a rock. Immovable. Uncomprehending. Stalwart. I always tell people not to read comments open to the general public. Don’t argue on the internet. You’re wasting your voice. I wasted my voice arguing with a rock. In the end, you just have to give up and step back. You cannot change a rock. You cannot force them outside of their tiny box. This is what the Unfollow option is for on Facebook. This is why muting and blocking and all of those other tools exist. Leave the rocks in their boxes and move on. Fight a different fight. Save your words for people who will hear them.